The Arena Lviv Stadium is one of the newest and modern stadiums in Europe. 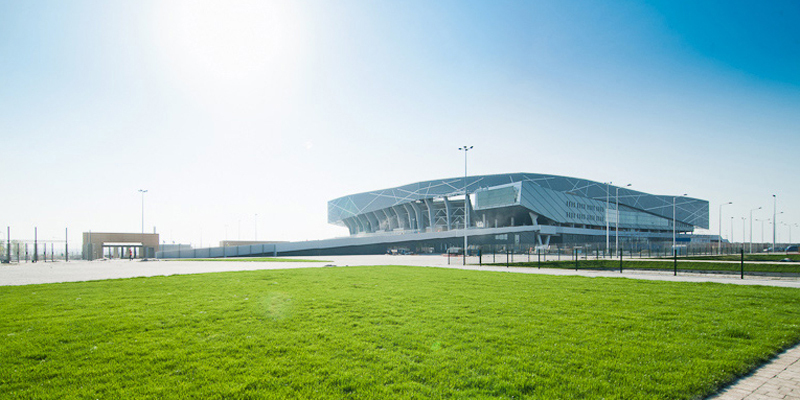 A comfortable and wonderful sports facility with a well-developed infrastructure is built on the occasion of European Football Championship Euro 2012, with the intention of hosting different sports and entertainment events at the highest level. The development of the stadium focuses on its gradual transformation towards a center of sports, culture and business in the city of Lviv. Arena Lviv complies with all UEFA requirements with regard to implementation of new technologies in building, information and digitalization. Special attention was paid to ensuring visitors comfort and safety. The stadium offers outstanding visibility from both upper and lower tiers. Thanks to the stands construction, a maximum feeling of presence on the field is guaranteed. The stadium has 34 915 seats, that are located under a partially transparent covering. Between the lower and the upper stands there is a so-called promenade, a stadium’s very special feature. Visitors enter the promenade after passing the turnstiles. It does not only regulate the visitor flow, but it also accommodates the most number of fast food restaurants and public rest rooms. The promenade encircles the whole arena and offers space for a walk. The area around the sports facility includes planting thousands of different plants – trees, bushes and flowers. The unusual system of lawn watering is also harmonically connected to the surroundings: two pools near the stadium gather the rainwater for further utilization.